This is a pass-me-down Animal Puzzle from Shern's cousins. When I brought it out for Shern about half a year ago, he used to have no interest in it at all. He just chucked it aside and preferred to play with his other toys instead. And even when I tried to persuade him to play with the puzzle, he would grew frustrated because he did not know how to put the puzzle pieces into the correct 'hole'. He tried using his strength which did not help and after that he gave up, feeling frustrated. 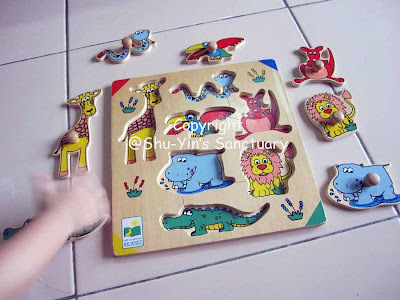 But now that he can recognizes animals such as horses since we brought him to the Penang Turf Club Expo, he likes this puzzle. And also since he loves his Dear Zoo book, he loves pointing out the lion, elephant and the snake. 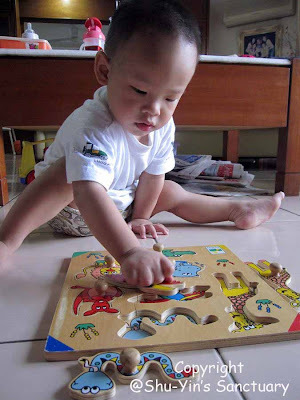 So his interest in this Animal Puzzle grew and is now more matured and interested to play with it. And also what I recently mentioned is true: that he recently loves playing toys which needs handling of his hands such as stacking and playing with his loop-y toy. And now with this Animal Puzzle. 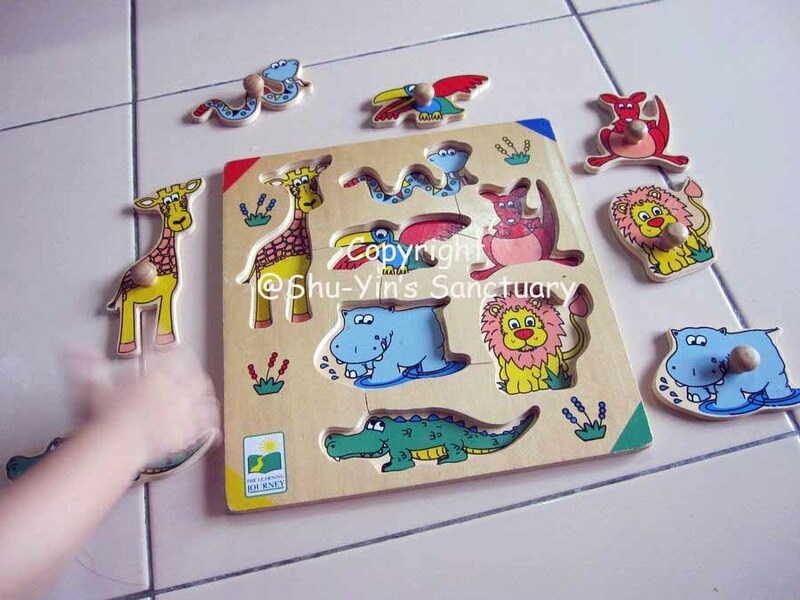 This Animal Puzzle is from The Learning Journey based on the logo at the bottom left corner of the puzzle. It is very suitable for Shern's age because it is simple with replicas of the animals in the 'holes'. And I love the bright colours of them. I also like that the animal puzzle pieces are big and that they have a knob on it for Shern to grip on it. Shern also has a branded Melissa and Dough's Number Puzzle but I find that the knob is too small and is difficult for him to grip. He now understands that he needs to put it into the similar picture 'hole' and to twist and turn a little so that the pieces could fit it. With a little guide and help from me, he can now sit and finish the whole puzzle!